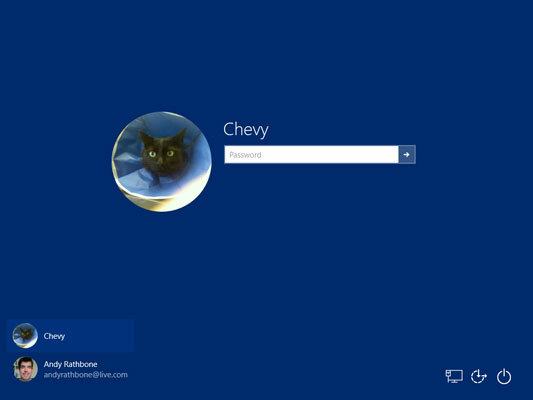 To begin playing with the PC, people click their account’s name when the Windows Sign In screen first appears, as shown here. Windows lets users sign in under their own accounts. Administrator: The administrator controls the entire computer, deciding who gets to play with it and what each user may do on it. On a computer running Windows, the owner usually holds the almighty Administrator account. He or she then sets up accounts for each household member and decides what they can and can’t do with the PC. Standard: Standard account holders can access most of the computer, but they can’t make any big changes to it. They can’t run or install new programs, for example, but they can run existing programs. Child: The Child account setting is actually just a Standard account with the Family Safety settings automatically turned on. Guest: Guests can play with the computer, but the computer doesn’t recognize them by name. Guest accounts function much like Standard accounts but with no privacy: Anybody can sign in with the Guest account, and the desktop will look the way the last guest left it. It’s great for impromptu web browsing but not much else. In a family, the parents usually hold Administrator accounts, the kids usually have Standard accounts, and the babysitter signs in using the Guest account. In a dorm or shared apartment, the computer’s owner holds the Administrator account, and the roommates have either Standard or Guest accounts, depending on their trustworthiness level (and perhaps how clean they’ve left the kitchen that week). To keep others from signing in under your user account, you must protect it with a password. Sometimes somebody will be signed in to her account, but the computer will go to sleep if she hasn’t touched the keyboard for a while. When the computer wakes back up, only that person’s user account and photo will show up onscreen. Windows 10 lists the other account holders’ names in the screen’s bottom-left corner, though, letting them sign in with a click on their names.